The Los Angeles Police Commission forwarded to Mayor Antonio Villaraigosa on Tuesday the names of three finalists to become the next police chief — a list that contained no women or minorities, but sparked little initial criticism. ….In the not-so-distant past, when tensions between the LAPD and minority communities in the city ran high, the selection of three white men as finalists would almost certainly have set off intense criticism. On Tuesday, however, news of the decision was met generally with praise as officials and outsiders said reforms made under [Bill] Bratton had largely rendered racial and gender politics a moot point. John Mack, the commission president and a prominent African American civil rights activist, said he was struck by how little attention was devoted to race and ethnicity when the panel held community meetings throughout the city seeking the public’s guidance on a new chief, including in Watts, Crenshaw and the San Fernando Valley. 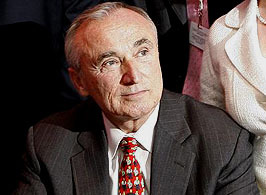 The day is young, and racial politics may yet rear its head, but if Bratton has really accomplished this it’s a helluva lot more impressive than any of his other reforms.